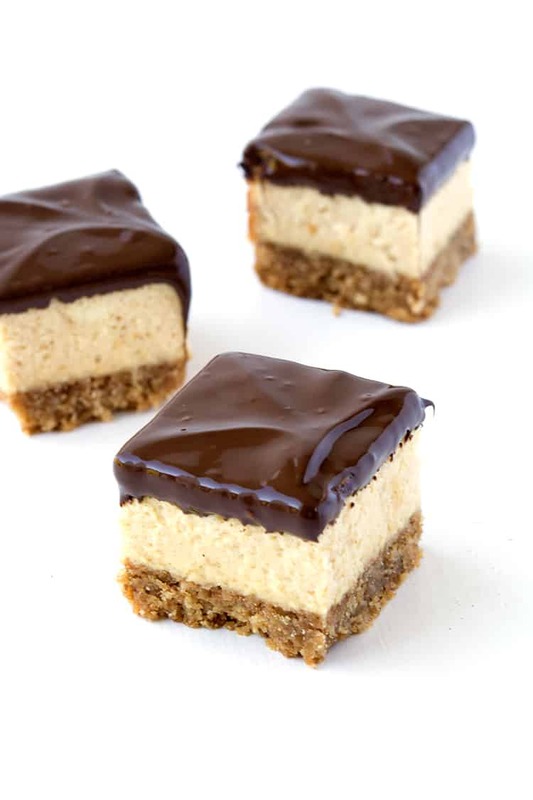 If you love peanut butter, you’ll adore these gorgeous Chocolate Peanut Butter Cheesecake Bites. 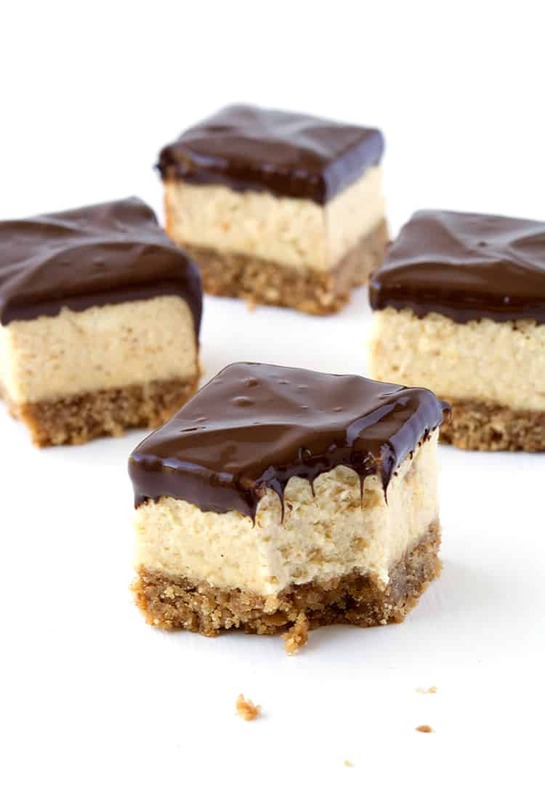 Crumbly cookie crust topped with creamy peanut butter cheesecake all dipped in chocolate. I’m ALL about that cheesecake at the moment. Baked or no bake, plain or dressed up, I cannot get enough cheesecake in my life. But today’s cheesecake is extra special. 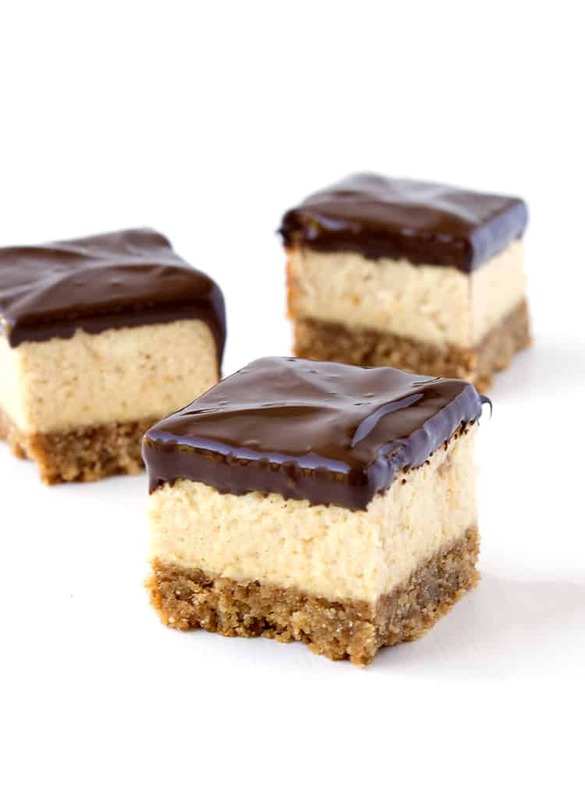 It’s a creamy baked peanut butter cheesecake with a crumbly crust and a chocolate-dipped top. Hello! I love peanut butter, but peanut butter cheesecake – baked peanut butter cheesecake at that – is another story altogether. This is heaven on a plate. Because this cheesecake is baked, it has the most luscious texture. Super smooth and sweet, with a hint of peanut butter alongside the deliciousness of the cream cheese. Oh and but before you worry, this baked cheesecake recipes does NOT need a water bath. This is a beautiful no-fuss baked cheesecake – which is really how I like all my desserts. Simple but oh SO tasty. 1 Be careful not to over beat the mixture, just mix until combined. Even turn off the mixture and just do this gently by hand if you are worried. 2 Follow the instructions around baking and cooling the cheesecake. Letting it sit in the oven after its finished baking with help it settle slowly, reducing the risk of cracks. 3 Let this cheesecake sit in the fridge until it is completely cool, before cutting and dipping. And tip 4 is to enjoy your creation! 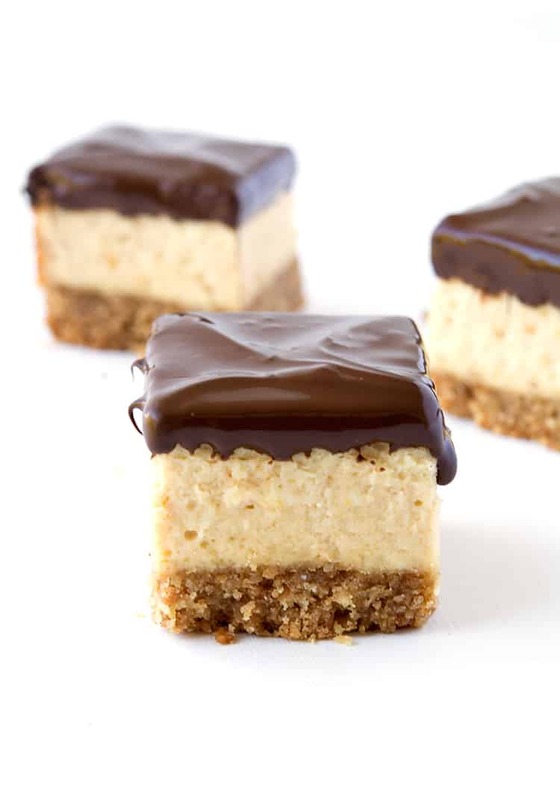 You can dip these cheesecake bites in your favourite chocolate. I used dark chocolate, but milk or even white chocolate would also work really well. These gorgeous cheesecake bites are perfect for entertaining. 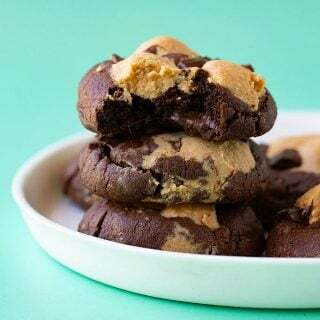 They’re bite-sized and easy to hand out at a dinner party or serve up for girl’s night in. Best of all, they taste INCREDIBLE. 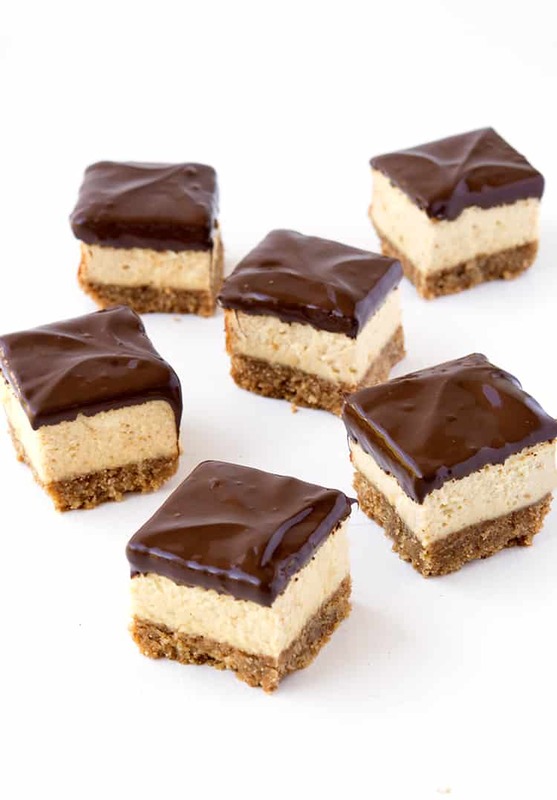 Chocolate-dipped peanut butter cheesecake bites with a crumbly cookie crust. Preheat your oven to 160 C (320 F). 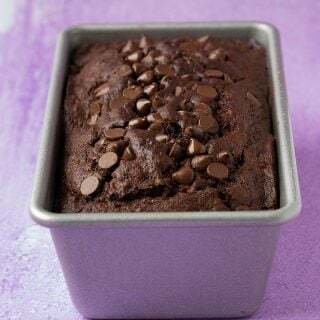 Grease and line an 8 inch square pan with baking or parchment paper, ensuring two sides overhang. Place your cookie crumbs in a large mixing bowl. Melt your butter in the microwave, then pour over the cookie crumbs and mix well. It should resemble wet sand. Place your crumbs into your prepared pan and press down gently to form one even layer. Pop in the fridge. Next, add your cream cheese to a large mixing bowl and beat until smooth and creamy. Add your caster sugar and vanilla and beat again. Then add your eggs, one at a time, until combined. Then stir in your greek yogurt. Finally add the peanut butter and stir until smooth but try not to over mix. Pour your cheesecake filling over your crust and smooth over the top. Bake in the oven for approximately 35 minutes or until it no longer wobbles in the middle. Try not to over bake it as it will continue to cook as it cools. Leave the cheesecake in the oven with the door ajar for at least one hour. Melt your dark chocolate in the microwave, stirring every 20 seconds, until smooth. Stir through the oil. 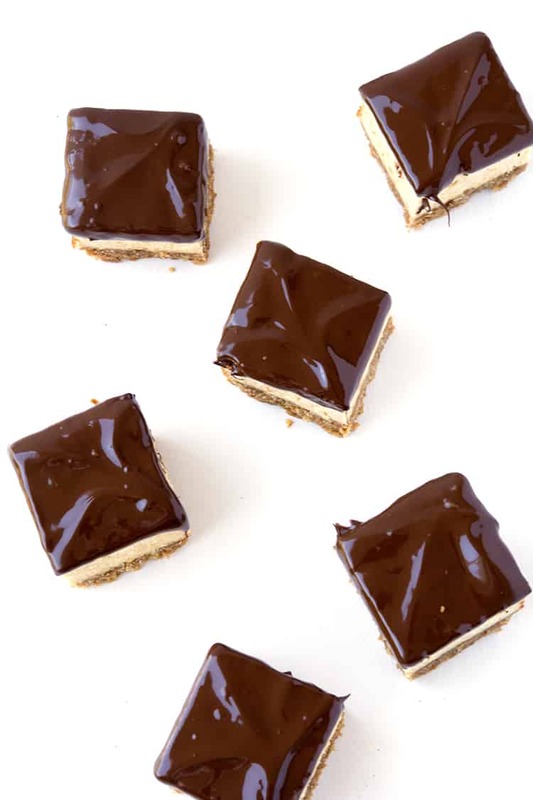 Carefully chop the cheesecake into squares and then dip each one in the chocolate and set aside for a few minutes to set. What size pan did you use to bake these in? Hi Amanda! I used an 8 inch square baking tin. Hope that helps! Sorry even before attempting to bake this , just asking a question. Will it be ok if the chocolate is poured over the cheese cake before it’s cut? And then cut to bite size once the chocolate is set.. I am just worried that the cheese cake will separate from the base if I turn it over to dip. 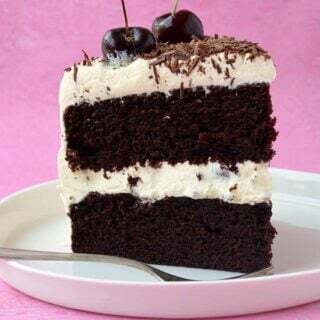 This looks so divine, want to bake it today itself. Absolutely loved these! The peanut butter cheesecake was so smooth and creamy. Everyone loved them! I love hearing that! Thanks for the lovely feedback Josh! Ooooh, this looks AMAZING! 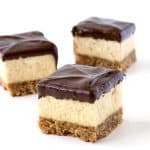 I love chocolate, peanut butter and cheesecake so combining all three is a delicious idea! omg those chocolate tops! These look seriously perfect and exactly what I need for an afternoon pick-me-up (or um, possibly breakfast! ).